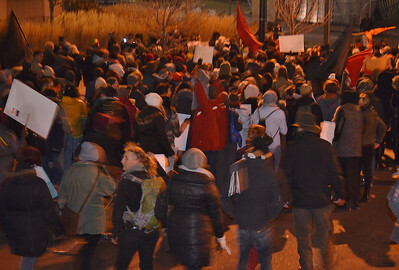 Rally and march in Denver Colorado to protest the grand jury decision in Ferguson Missouri. 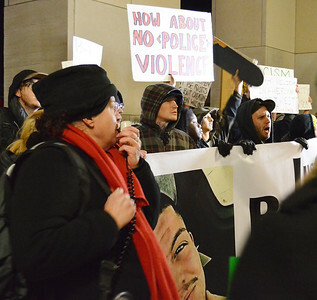 Includes images of protesters marching with signs and banners, sitting down in city street insection, police in riot gear, protesters suffering the effects of pepper spray. 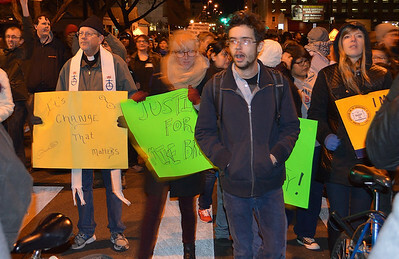 Large group of demonstrators standing on sidewalk next to street, holding signs about Ferguson grand jury decision. 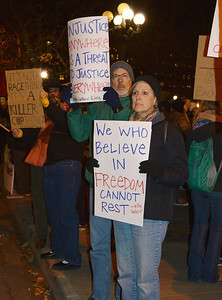 Man and woman holding signs about justice and freedom, behind them woman with sign about "killer cops". 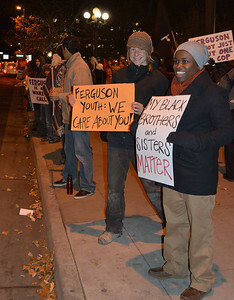 Young man and woman holding signs protesting Ferguson grand jury decision, other demonstrators in the background. 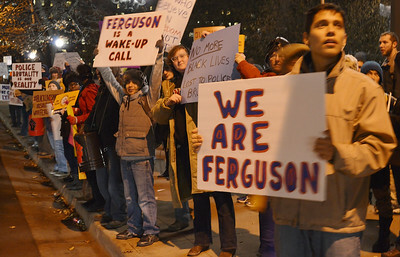 Two women holding signs about Ferguson grand jury, standing next to street, other protesters with signs in background. 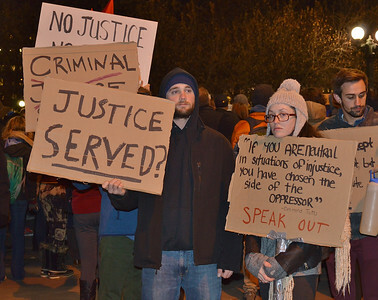 Three protesters holding signs about Ferguson grand jury decision, more demonstrators in the background. 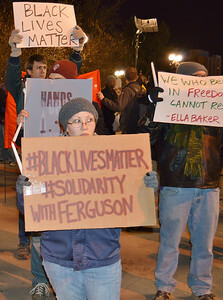 Young woman holding sign "#Black Lives Matter", other protesters with signs behind. 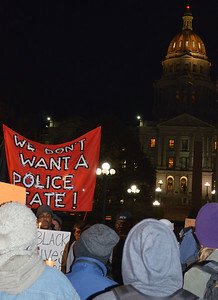 Group of protesters, one African American man holding candle, banner above them reads "We Don't A Police State", in the background lighted capitol dome. Large group of protesters including clergyman wearing clerical collar. 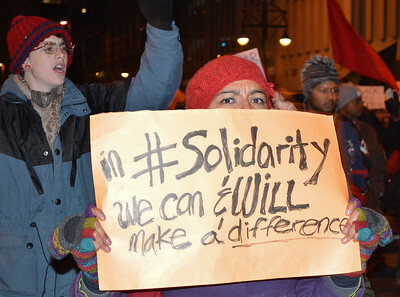 Woman looks over top of sign she is carrying about solidarity, other demonstrators march behind her. 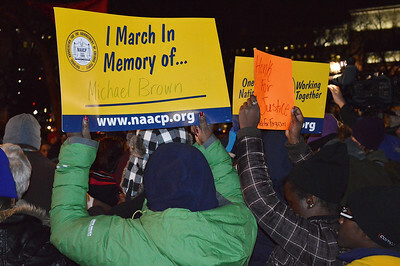 African American woman holding up sign "In Memory of Michael Brown", NAACP logo on it, other protesters around her. 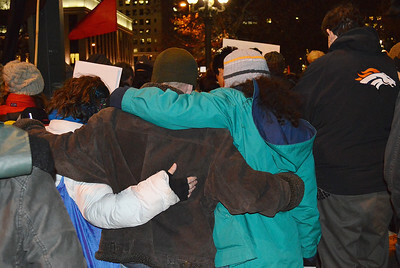 Protesters with arm around each other, observe moment of silence, one with Denver Broncos logo on jacket. 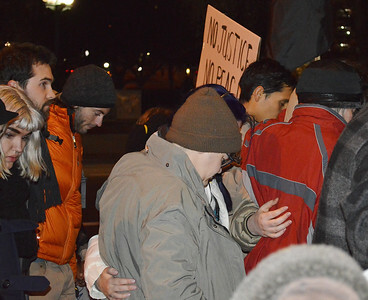 Group of protesters with arms around each other and heads bowed, observe a moment of silence. 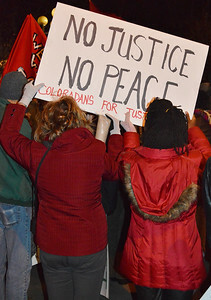 Two women holding up sign "No Justice, No Peace". 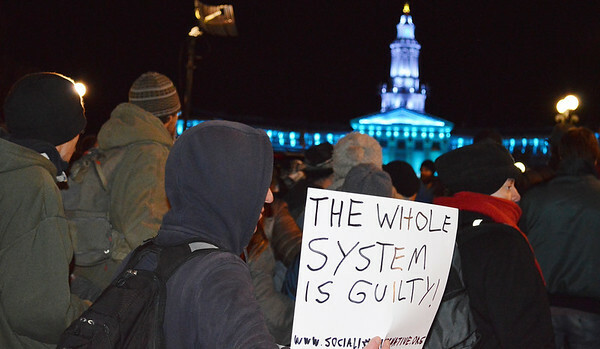 Group of protesters, one holding sign "The Whole System Is Guilty", building with Christmas lights in the background. 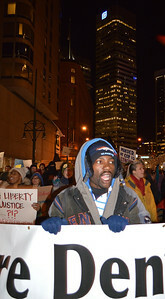 African American man wearing Denver Bronco cap carrying banner, other protesters with signs about Ferguson grand jury decision behind him, in the background, tall office building with light on. 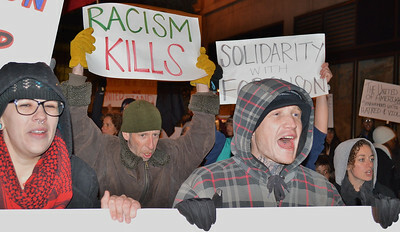 Protesters shout while carrying banner, other demonstrator with sign "Racism Kills", behind them. 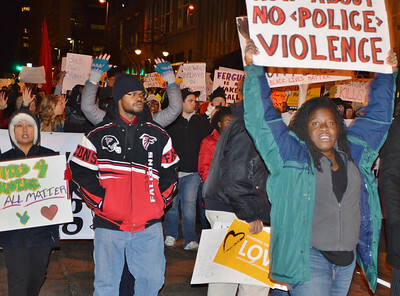 African American woman raises sign above head "No Police Violence", large group of protesters marching behind her, some with hands raised in the air, one wearing Atlanta Falcons jacket. 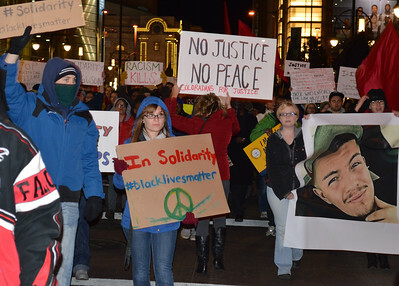 Large group of protesters marching down city street with signs and banners about Ferguson grand jury. 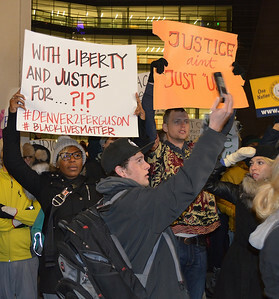 Young man raises cellphone to take "selfie", protesters with signs about Ferguson grand jury decision in background. 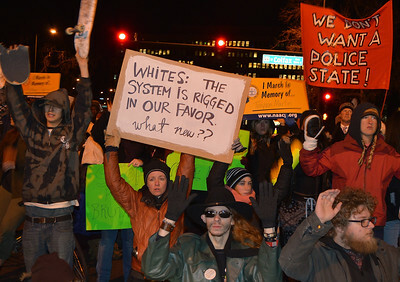 Woman speaking into microphone, next to her protesters with signs about Ferguson grand jury decision. 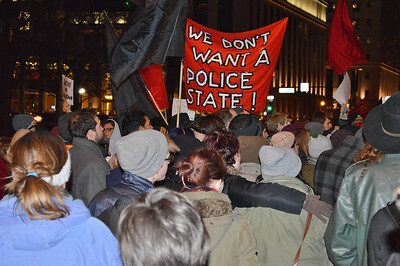 Large group of protesters, banner above them "We Don't Want A Police State". 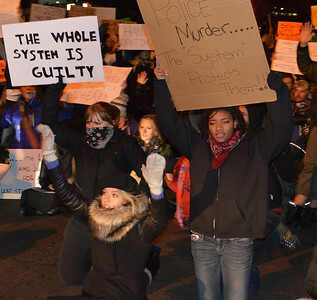 Protesters with signs about Ferguson grand jury decision raising hands in the air, some sitting in the street. 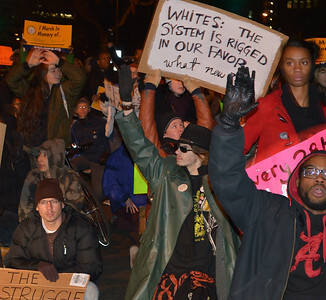 Large group of protesters with signs about Ferguson grand jury decision sitting down on city street, some with hands raised in the air. Young woman wearing leather njacket and hoodie, raising hands in the air and shouting, other protesters behiond her with signs. 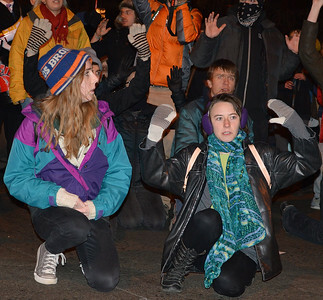 Two young woman sitting on city street with hands raised in the air, other priotesters behind them. 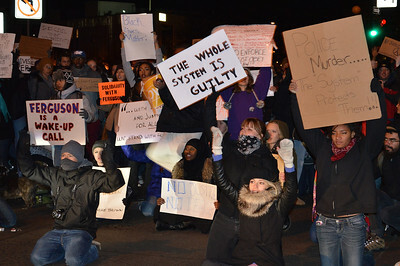 Three protesters holding signs about Ferguson grand jury decision kneeling on city street, other demonstrators with signs behind them. 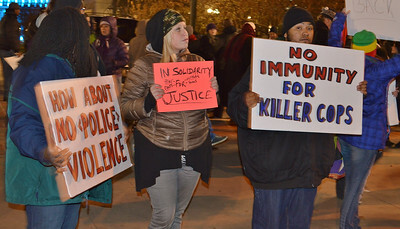 Young African American woman raises sign above head about police murder, other demonstrators behind her with signs. 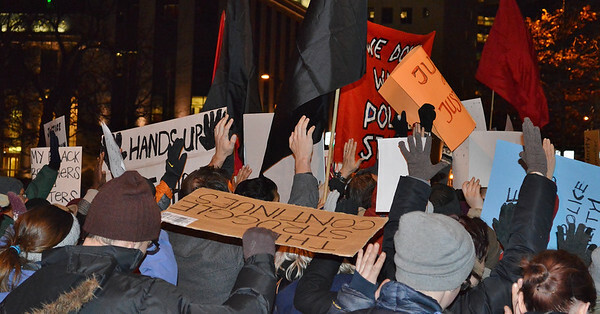 Protesters with signs about Ferguson grand jury decision standing in city street, some with hands raised in the air, some with signs and banners. 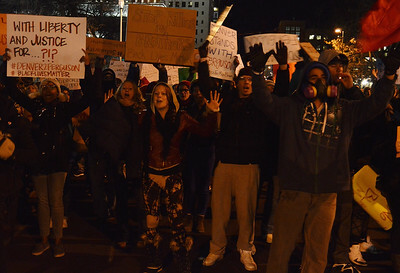 Large group of protesters raising hands in the air, some carrying signs and banners. 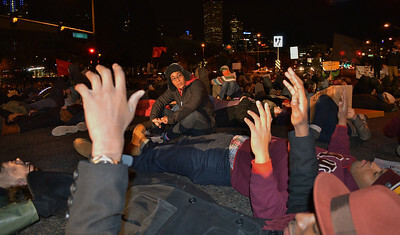 African American man sitting up among large group of protesters laying down in city intersection, two demonstrators in foreground raise their hands in air. 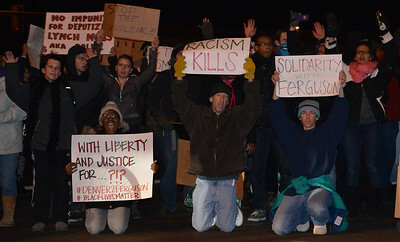 Large group of demonstrators laying down in street intersection to protest Ferguson grand jury decision, one sitting up. takes picture with cellphone. 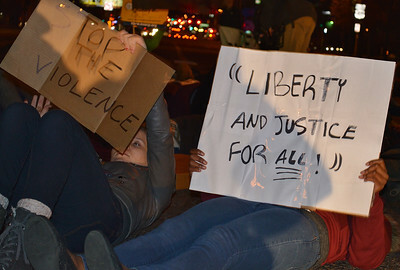 Woman sitting among protesters lying in street intersection takes picture with cellphone. 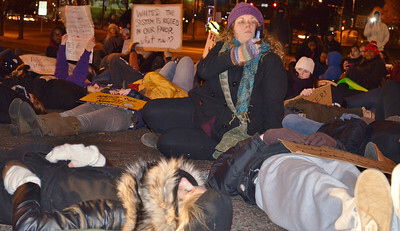 Two protesters laying down in street intersection holding signs about Ferguson grand jury decision. 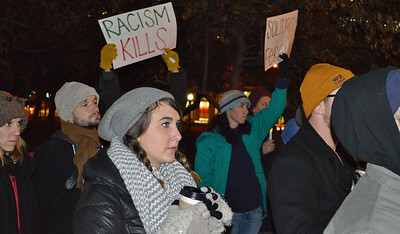 Young woman wearing hat and scarf, holding cup of coffee, in the background protester with sign "Racism Kills". 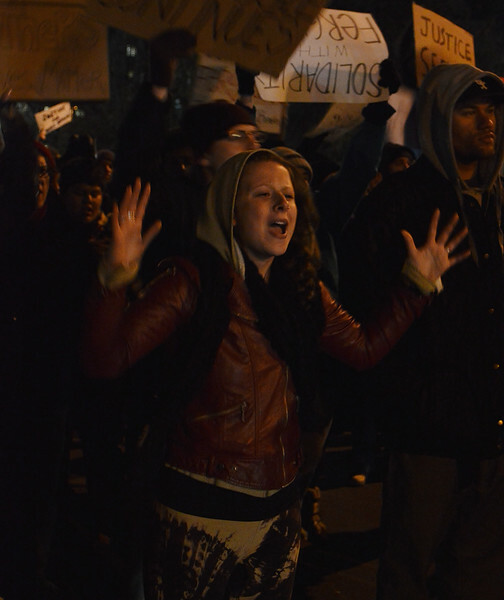 Large group of demonstrators holding hand up in the air, some holding signs. large group of protesters marching down city street with signs and flags about Ferguson grand jury decision one in wheelchair, capitol dome in the background. Large group of porotesters seen from behind, some with red flags. 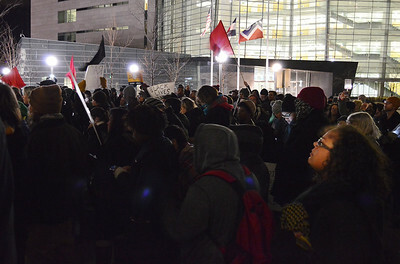 Large group of protesters gathered together in front of building, some with red flags, one mans face illuminated by cellphone, City of Denver flag in background. 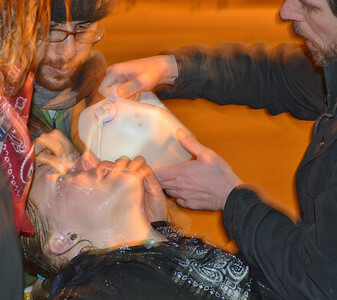 Young woman who hand been tear gassed, with milk running down her face. Man pouring milk into eyes of demonstrator who had been tear gassed. 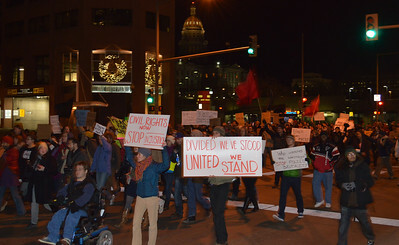 Large group of protesters marching down city street with signs and large banners about Denver Police and Ferguson grand jury decision, in background large office building with bright lights on it. 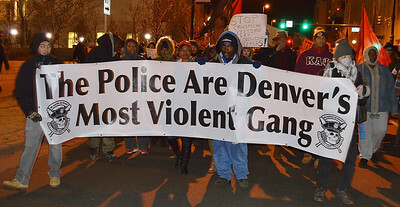 Large group of protesters with signs and banners about Denver Police violence. 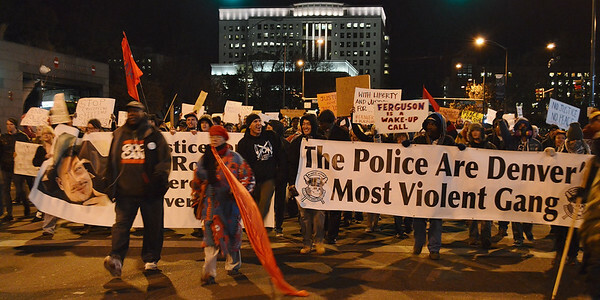 Protesters carrying large banner about Denver police violence, other demonstrators marching behind them. 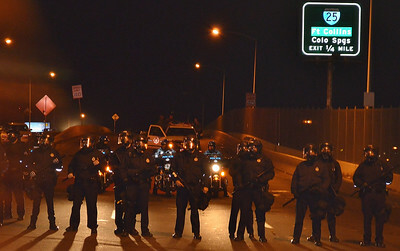 Line of police in riot gear, including gas masks, behind them police on motorcycles, and on side of police vehicle, above is I-25 street sign. 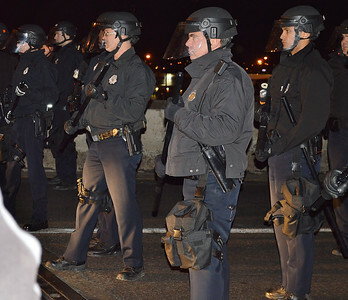 Police officers wearing riot helmets and holding battons. 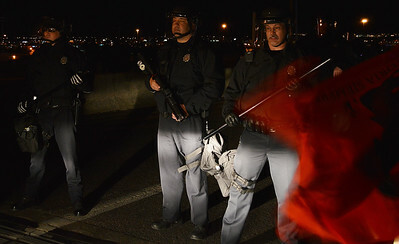 Police officers in riot gear, one holding tear gas gun, red flag to the right of frame.